In the summer, Washington’s largest ski area transforms itself into a summer vacation paradise with wildflowers, marmots, foxes and elk. Come up for an overnight visit, a weekend or a weeklong vacation. You’ll be talking about it for years to come. A “must do” for summer vacationers from out-of-state and abroad, and an incredible experience for those who live in-state. Journey almost 2500’ in elevation across beautiful alpine meadows and babbling mountain streams to Crystal Mountain’s summit with one of the best views of Mt. Rainier anywhere. Have lunch or dinner at the Summit House (see below) or hike through high alpine meadows. For 2018, the Mt. Rainier Gondola will be open daily from June 22 – September 16. Click here for details. At 14411′, Mt. Rainier towers over the Puget Sound lowlands and its majesty attracts visitors from all around the country and around the world. We’re closest to the Sunrise area, which, at 6400’ has the most panoramic views and hikes in the Park. But it’s easy to use us as a base to explore other areas as well. The Ohanapecosh with its Grove of the Patriarchs (a stand of 1000 year old trees) is just about 20-25 minutes south of here and Tipsoo Lake, with its incredible wildflowers, is an easy 20-minute drive. Paradise is just a little over an hour away, and you can enjoy a gorgeous drive through Stevens Canyon and Box Canyon on the way. Visit our sister website, www.StayRainier.com, for more information. Ride the Mt. Rainier Gondola to Washington’s highest restaurant for an unforgettable experience. The Summit House offers gourmet dining and great views of Mt. Rainier from its location at 6872′. Lunch is offered daily in the summer, with extended hours on Saturday. Learn more here. Crystal Mountain Outfitters offers trail rides every day from approximately late June to Labor Day. Are they fun? Just ask our guests who sign up again and again. Learn more here. Join a local guide for a short (45min – 1 hour), interpretive hike from the summit of Crystal Mountain. Learn about local flora and fauna, human history and the geologic processes which have shaped this unique alpine landscape. Tours are complimentary and open to everyone. Creaky knees and leashed dogs are welcome! 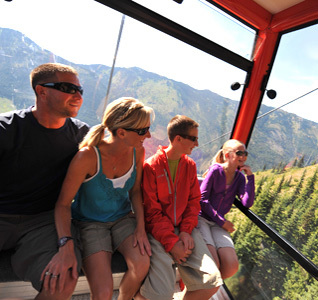 Tours are offered Friday-Sunday during Crystal Mountain’s summer season. Click here. Crystal Mountain offers 30 holes of disc golf with two courses that share the back 9. Very fun! Click here. What could be better than a yoga class in a mountain meadow? Classes are offered on select Saturdays throughout the summer, in the Discovery Meadow at the base of the Mt. Rainier Gondola. This class is designed to stretch and strengthen all the muscles needed for a day of exploring the surrounding mountains. On select Thursdays there are also Yoga Retreats, led by local skier and yoga instructor Jen Rudnick. The yoga retreats are designed to relax your body and mind, starting with a yoga session at the top of the Mountain, a meal at the Summit House Restaurant, and a guided hike through the woods ending with an afternoon yoga session in the Discovery Meadow.